Application of new techniques in the petrographic analysis of metallurgical coke reveals the prediction of CSR from the maximum reflectance of coke, and provides an understanding of how different ranks and types of coals are manifest in the types of cokes. Measurement of the bireflectance of coke is not new. It was described by Jeulin and Lenoir (1987), by Eilersten, et al. (1995), and more recently by Crelling et al. (2005). The technique involves rotating a polarizer in the incident light beam of the microscope, and measuring at each pixel site, the reflectance in oil. Then a map is constructed showing for each pixel the maximum reflectance value, the minimum reflectance value, and by difference, the bireflectance. These maps can then be colour-coded by bireflectance, and other techniques. Three such maps are shown below. Although superficially similar, these are not photomicrographs. The maps are computer generated, and are a new technique in the interpretation of coke petrography. Traditional coke microscopy involves point-counting the volume percent of textural components in coke by applying a microtextural classification (ASTM D5061, for example), the results of which are a table of sizes and identities of the carbon forms present. Preparations of lumps of coke for imaging is as important as the sample itself. We have developed new methods for slabbing and embedding whole pieces of coke, for presentation to Standards Organizations. These are critical for understanding how a coal is coked; where and when plastic layers stall, and where Inertinite porphyroclasts are deposited, as coal transitions to coke. 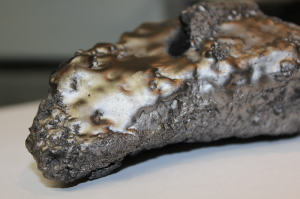 This piece of coke is approximately 20 cm in length, and was sectioned to show the vapour-phase carbon deposits on the upper surface. The section was embedded in a polyester resin, and polished using a standard automatic polishing unit. 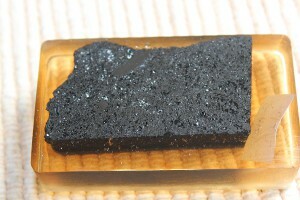 Several hundred sequential images were stitched together forming a mosaic, shown below, where, to the left, a large sliver of pyrolytic carbon is draped on the outer edge of the coke. 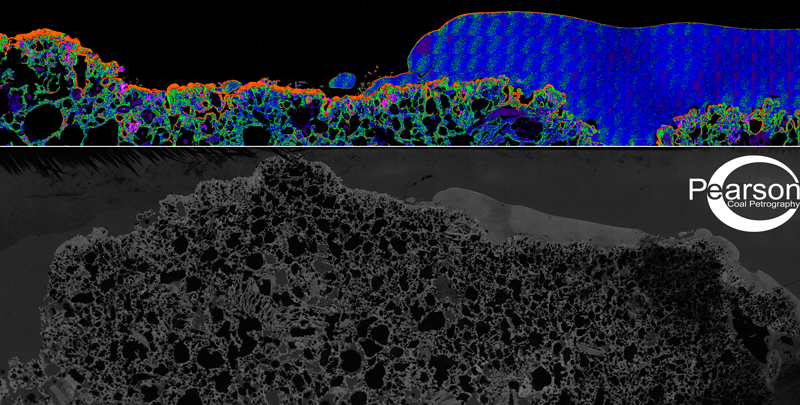 To the right, a 4 mm thick layer of vapor-deposited isotropic carbon (in blue) is intriguing. The outlines of each 250-micron square stitched image can be seen within this blue mass. A thin protective layer of orange-coloured pyrolytic carbon covers, and protects this carbon. Individual carbon fibers can be seen above the tusk of the Narwharl-like shape. 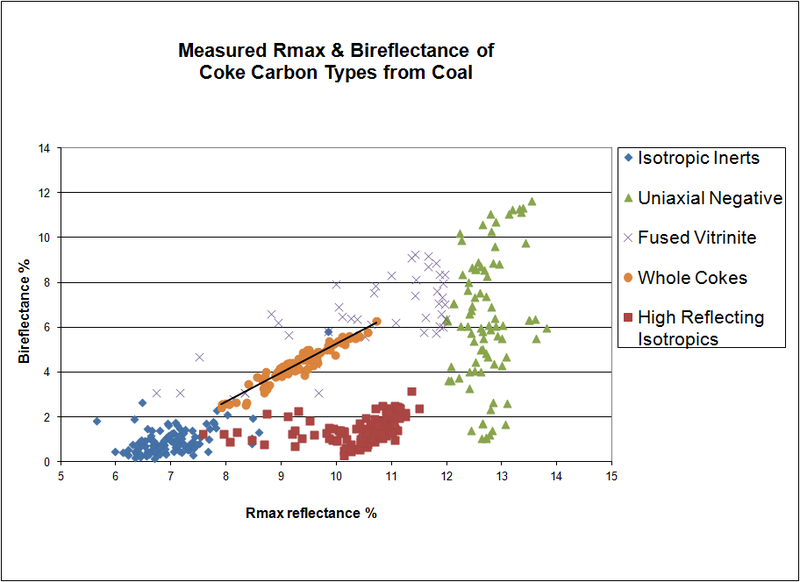 The carbon forms seen in coke are distinguished and separated based on their measured values of Romax reflectance and Bireflectance, as show below. Reflectance data acquisition, necessary for the bireflectance techniques, is automated and uses a robotic microscope. Each image is spatially 1 megapixel, and there are ten images taken at different polarizer angles, for each location. Each coke sample is measured at 200 different locations, so the file for each coke is very large. Interpretation of the bireflectance maps is done by automated image analysis. The coloured maps above display the application of two techniques. On the left is a gray-scale bireflectance map. In the middle is the same bireflectance map, with thresholding techniques applied so that the bireflectance can be visualized with colour, violets indicating low bireflectance through blues, green, yellow and orange indicating higher bireflectance. This is bireflectance thresholding, but as a technique it does not separate carbon forms of different maximum reflectance. The image on the right has been interpreted using different algorithms, which discriminate between carbon forms with widely different optical characteristics. The areas of Fused Inertinite in pink which have high maximum reflectance, are differentiated from the unfused Isotropic Inerts, shown in violet, and which also share a low bireflectance. Each image is analysed using similar techniques, and the volume percent of the carbon forms is compiled from many millions of pixel data. The prediction of CSR has been the Holy Grail of much research, but until recently, little has been changed from the recognition of coal rank relationship, with a strong influence caused by mineral assemblages in the coal( See Pearson 1987, Influence of Geology on CSR). Pusz & Buszko 2011, demonstrated a linear relationship (R2 of about 90%), of increasing CSR with increasing mean Romax reflectance for Polish Cokes. Pusz’s data are from retort cokes and a photometer-based petrographic system, but our own data on test-oven cokes and CCD Petrographic systems confirm the general trend, except that once the peak CSR region is reached at about 1.37% to 1.40% vitrinite reflectance, higher coke reflectance is manifest by lower CSR Cokes. In other words, the function is parabolic. Because the parabolic relationship between coke Romax and CSR is so strong, our current line of research is to fine tune a prediction based on the mean random reflectance from the coal Fingerprint. The effect of coal rank on the mean Romax of coke is demonstrated by the two West Virginia Cokes illustrated earlier. In addition an increase in Fusible Inertinite at the expense of Vitrinite, also causes an increase in coke reflectance, and therefore in CSR. So a maceral influence on CSR is also involved. The chemical caveat to the prediction remains.